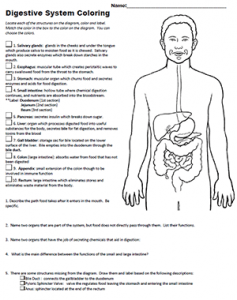 Coloring activities can be helpful to give students a chance to model the organ systems. Though it is a low level activity, keep in mind, that students sometimes need a little bit of “downtime” to process the information they have learned during dissections or class lectures. I use coloring as quiet time, as a way to reflect on how the organs are related to each other. Students will get out of the coloring what they put into it. Encourage students to really engage with the model, and not just color randomly. For example, as they color the stomach, think about what it does and how it relates to other structures. What is it connected to? What is its function? I have several coloring worksheets for many systems, though some are more difficult than others. In this example, “Human Digestive Coloring” students can find the structures by reading the descriptions. A variant of this activity is used with the anatomy students which has less guidance and will require students to reference their book or other resources to complete it. The advanced worksheet also includes specific sections of the large intestine (ascending, transverse, descending) and is not something I usually cover with younger students.